The Free Software Foundation (FSF) mounted its protests against "corruption" of the BBC by Microsoft in London and Manchester this morning. In filthy weather, about 20 assorted free software and open source advocates turned out at the BBC's Television Centre in west London. 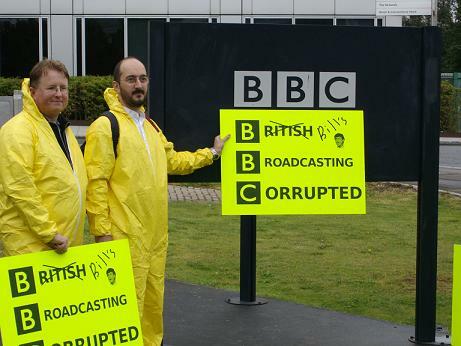 The protesters donned yellow jumpsuits and picketed a series of BBC offices clustered around White City. 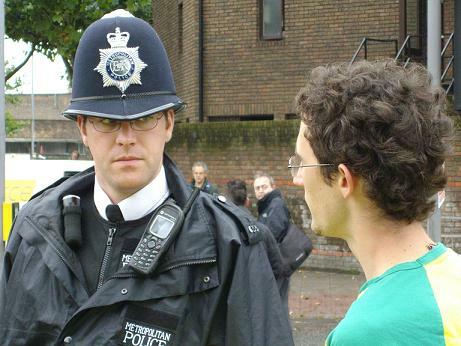 A couple of passing police showed similarly passing interest in the gaggle. As expected, nobody from BBC management or the BBC Trust came out to speak to the protesters. Some BBC staff from technology divisions did engage in discussions, but asked not to be identified. The action had been organised by the Free Software Foundation's executive director Peter Brown, who had flown in from the US to attend. A British ex-pat who worked in BBC Radio's finance department in the late 1990s, Brown said: "Software freedom doesn't stop at the gates of the United States. The BBC historically stood for openness. We have now got a group inside the BBC who are very close to Microsoft and Bill Gates." Erik Huggers, former director of Microsoft's Windows Digital Media division, was appointed controller of the future media and technology group at the BBC in May. Although the appointment was made after the decision to allow a Windows-only iPlayer, the FSF argues that the BBC Trust, which is the corporation's own watchdog, takes its technical advice on iPlayer from his staff. Brown contrasted today's BBC's acceptance of Windows Media DRM for iPlayer with the organisation which in 2003 battled for and won the right to broadcast its channels over satellite without encryption. The Free Sofware Foundation is against all DRM. Also present at the protest was the Green Party's chief spokesman Derek Wall. He said people who argue that the Windows-only iPlayer lock out will only affect a small number of people are "rather foolish". He argued that similar monopolistic behaviour from Microsoft had created the stranglehold in the first place. "The BBC should be taking a lead on this sort of thing, not toeing the line." The BBC says its content partners will not allow it to distribute shows over the internet without Microsoft DRM. The Open Source Consortium, a separate open source advocacy group, has been pursuing the multi-platform thread of the iPlayer openness row through Ofcom, the Office of Fair Trading, and the BBC Trust. It has now arranged a meeting with BBC management for mid-October and is preparing an approach to EU competition regulators.